Sodium Hydrosulfide Market size was over USD 240 million in 2017 and industry expects consumption of above 450 kilo tons by 2024. Growing leather goods demand has led to rise in leather products which is like to have positive impact on sodium hydrosulfide market size as an essential leather tanning chemical. It acts as a dehairing agent and generates minimal waste, thus reducing harmful effects on the environment. Global leather goods market may surpass USD 125 billion by 2024. Consumer inclination towards designer leather products along supported by availability of various fashion brands will favour industry growth, thus driving product demand. Sodium hydrosulfide (NaHS) market size is anticipated to grow significantly due to its less toxic nature as compared to sulphur, due to which it can used as an alternative to sulphur. Due to its versatility it can with numerous chemicals during reaction to form new compounds, which is anticipated to expand its market size. Strong R&D to examine sodium hydrosulfide in formulating drugs as it is examined to be able to reverse effects of disruptive kidney injury. Effects including decreasing cortical thick-ness and an increase in matrix proteins can negatively affect kidney and this product can be effective in treating this condition if used at certain dose. Global pharmaceuticals R&D spending is likely to surpass USD 200 billion by 2024, which is anticipated to fuel product demand in forecast timeframe. NaHS is an alkaline product which plays a vital role in numerous industrial process including, dyes and agricultural chemicals. It is also a key constituent in numerous industrial methods concerning sulphur necessities as it is a low cost and less toxic alternative to sulphur, thereby propelling product demand. Sodium hydrosulfide finds application in elemental sulphur and sulfuric acid manufacturing. The product can also be used as a chemical intermediate in the manufacturing of pharmaceuticals, rubber chemicals, dyes, pesticides, polymers, plastic additives, and leather, thus driving industry growth. NaHS acts as intermediate in the production of thio chemicals owing to property of acting as a highly reactive form of sulphur. These chemicals are used in textile industry, in vulcanization accelerators and in manufacturing flame retardant resins, thus driving product demand in forecast timeframe. Different complexities in its manufacturing process like high cost, low output and explosion danger may hamper industry profitability, thus affecting sodium hydrosulfide market price trends. However, growing application range in production of heavy water in the nuclear industry, as analytical reagent will propel industry growth. Liquid form segment is poised to surpass USD 265 million upto 2024. These products are used industries including leather, textile and pulp & paper due to its property of being highly soluble in water and alcohol, which is anticipated to fuel product demand. 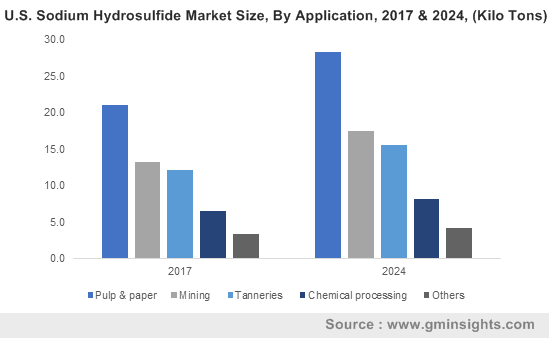 Solid sodium hydrosulfide market size may observe strong gains at over 3.5% by 2024 due to its application in chemical industry. It has wide application as a substitute for sodium sulfide for sulphidization of lead, zinc, copper and oxides of copper for making them amenable to collector material. Easy availability and cost effectiveness over other substitutes will contribute towards industry growth. Technical grade segment may exceed 365 kilo tons in the forecast timeline. These products are used in plastic and paint industry to produce dye accompanied with its application in waste treatment programs which requires reduction & stabilization of heavy & toxic metals through the means of precipitation durability. Increasing product consumption in water treatment industry owing to strict regulations regarding water pollution along with expanding water treatment system market, which is anticipated to reach USD 40 billion by 2024 may propel product demand. Growing research to examine its use in reducing kidney injury and treating rare disease will promote sodium hydrosulfide usage in pharmaceutical sector, thus driving overall product demand. Sodium hydrosulfide market size from pulp & paper application is poised to outdo 190 kilo tons in forecast timeframe. It acts as a reagent in Kraft process to maintain the level of sulphur along with and used as catalysts to increase reaction rate of paper processing, thereby stimulating product demand in the forecast timeline. Mining application segment is likely to witness gains of over 3.5% by 2024 owing to feature of acting as floatation agent. It is used in mining of metals & salts due to its good solubility in water, it precipitates heavy metal from the ore, resulting in easy recovery of metals. Rising influence towards efficient metal recovery along with growth in mining and exploration activities is likely to contribute towards industry growth in projected timeline. 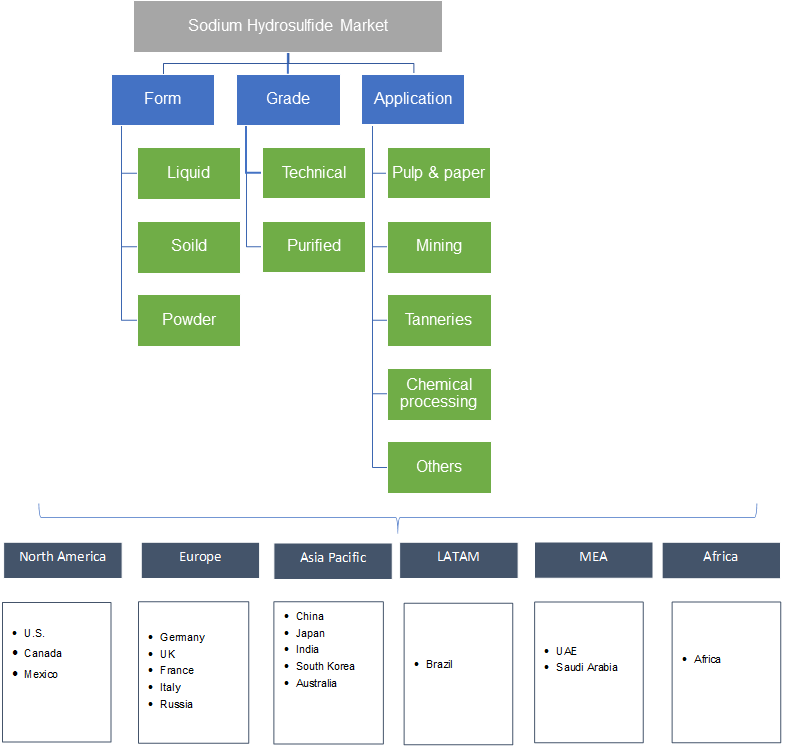 Asia Pacific led by, Australia, Japan, South Korea, India and China sodium hydrosulfide market size may surpass USD 190 million at the end of 2024 owing to presence of major manufacturers of leather products including footwear mainly in India and China. The product is used to remove hair from animal skin during leather production, thereby driving regional product demand. Europe driven by Italy, France, UK, and Germany market size may observe significant gains over 3% up to 2024 due to strong mining industry. Sodium hydrosulfide is used as a flotation agent in mining industry including extraction of molybdenum, nickel, cobalt, copper and zinc. Brazil market size may witness strong gains on account of growing pharmaceutical industry. The product has been researched for its potential medical applications, which will fuel product demand. Global sodium hydrosulfide market share is competitive and moderately consolidated. Key players operating in this industry include Solvay, Henan Yindu Chemical CO., LTD., Merck, TCI Chemicals, Cayman, AkzoNobel, Tessenderlo Group, Genesis Energy, Chemical Products Corporation and Chaitanya Chemicals. Companies are focused on expanding their production capacity in order to retain increase their consumer base and enhance their market share. Sodium hydrosulfide manufacturer are investing extensively on R&D to sustain in changing market dynamics. Sodium hydrogen sulphide (NaHS) is an inorganic gas produced by degradation of organic matter and it is substantially present in anaerobic sediments. The product is obtained from half neutralization of hydrogen sulfide with sodium hydrogen oxide. These products find application in industries including, leather, mining, chemical processing and pulp & paper industry. Moreover, growing application potential as disinfectant in agriculture along with usage as additive in extreme-pressure lubricants and cutting oils is anticipated to foster industry growth. Major industry participants are engaged in technical advancements for improve production techniques which may act as another contributing factor towards industry growth.